As part of a three-part series on food security, reporter Catherine Whitnall wrote last week about the cost of eating when using the new Canada Food Guide. This week, she looks at the cost of growing your own food. Before the advent of grocery stores and markets, people really had no choice but to grow their own food. In the past decade, though, a growing number of people have been turning back to the land to supplement their grocery shopping. 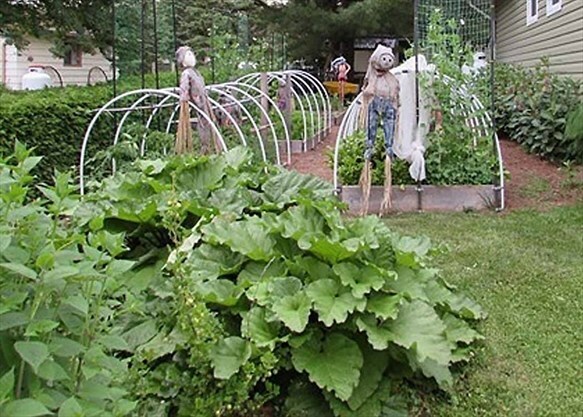 For some, it gives them peace of mind knowing where and how their produce is grown. For some, it’s a way of reducing their grocery bill. For many, it’s a combination of both. In the grand scheme of things, it makes sense. “The big difference is that we know what’s in that plant and where it comes from,” said ecosteward Robbie Preston. For those looking to garden at home, it’s a good idea to do a bit of math and research before committing, say Preston and fellow ecosteward Judy Kennedy. Soil that has a high clay or sand component isn’t terribly conducive to growing. “If you don’t have good soil, nothing will grow,” he said, logically. The best idea, adds Kennedy, is to construct garden beds instead. This is where the math comes into play. “A four-by-eight (foot) area is totally serviceable,” said Kennedy, noting it’s not so wide that the plants can’t be reached by hand. Many people make the mistake of constructing gardens that are too wide, resulting in having to physically walk into the growing area — which can be detrimental unless pathways are included — which is a waste of growing area. Frame and raised bed gardens also offer the advantage of heating up faster than the ground, boosting grow time, added Kennedy. Ideally, the frames should be constructed by rough cedar. Most lumber supply businesses sell the boards, but people can save a few dollars by purchasing from area sawmills. Not only does cedar last longer — up to 10 years versus three years with pine or spruce, according to Preston — but slugs won’t crawl up the wood. Cedar is a little more expensive than pine or spruce, though. Constructing one very basic cedar garden bed — not including screws — would cost and average of roughly $60 versus $35. Never use pressure treated wood, as the chemicals will leach into the garden. The big cost comes in filling the beds. Buying a good triple-mix soil from a local retailer to fill one garden bed could cost as much as $170. A bag of coir (coconut fibre) or peat moss would add roughly $8. Some of this cost can be reduced if the natural soil is decent for growing, as it can be partly blended with the triple mix. The upside is that once the bed is filled, it only needs to be topped up in subsequent years. “Every two years you will have to add about 15 per cent more,” said Kennedy. Both Preston and Kennedy agree that natural products are the way to go. “They can be a little more costly, but they work so much better and are better for the environment,” said Kennedy, who uses coir, which is better than peat moss for its slow-release properties and is renewable. While it is more convenient to visit a greenhouse or retailer to buy plants, Kennedy prefers to use seeds. Kennedy adds a few dollars in seeds can potentially yield 100 plants. She generally starts her seeds in containers in her home, using recycled fruit containers since they have openings for oxygen and work like greenhouses when closed. The only thing she adds, other than water, is a little vermiculite for extra nutrient support. Those looking to start gardens can also access area Seed Savers Collectives such as the seed library operated by the Nourish and Development Foundation in Cannington. The seed library provides “free and easy access to viable seeds so that as many people as possible are growing their own organic food and to encourage and enable people to save seeds through awareness, education, and community celebrations aimed at reviving seed saving culture.” Seeds are available at all three Brock Township public libraries. Anyone with a Brock library card can take seeds for free to plant in their garden and, in return, save some seeds to bring back to the library for other community members to use. Seed libraries focus on lending organic, native, heirloom and open-pollinated seeds. Seeds returned from successful plants help grow Nourish’s collection and help cultivate seed stocks best suited to the local climate and promote seed sovereignty. When it comes to planting, Kennedy recommends creating one-foot square “patches” that can be plotted out using chalk line or heavy string, available at most dollar stores. People should keep a diagram of what they’ve planted so they can “rotate” their crops as not all plants use the same nutrients from the soil and actually give something back. “So one essentially makes food for the other,” said Kennedy. She is also a big fan of companion planting, which can help with pest control, pollination, provide a habitat for beneficial creatures, maximize use of space and increase crop productivity. For example, onions grow well beside beets, carrots, Swiss chard and lettuce, but not beans or peas. Peas grow well with carrots, cucumbers and radishes, but not garlic or onions. Potatoes like beans, corn and peas, but not tomatoes. While it’s nice to be able to “walk outside and five minutes later it’s in the pot,” Kennedy notes her four garden beds produce more fruits and vegetables than she actually needs, saving her hundreds of dollars each year. Her basement still holds a variety of canned and preserved items from last year’s harvest. “I’d have to say it cuts our grocery bill by at least 50 per cent, if not more,” said Kennedy. All she needs is a few chickens and a cow … but that’s a whole other story.